Although Goa is a very small state, due to narrow winding roads and occasional traffic congestion, short distances can take longer than expected! Tuk-tuks and auto rickshaws, three wheeled cabin motorbikes, are also common and definitely offer a memorable experience but can be poorly maintained so use with caution. You will be able to spot them easily due to their prominent yellow and black paintwork. As a tourist it is not advisable to hire cars or motorbikes whilst on holiday in Goa. The rules of the road are very different to what we are accustomed to in the UK. The roads themselves can be challenging to navigate and in a poor condition. Train services, although a great way of travelling between Indian states, are not the easiest way to travel within Goa. Often for the short distance required a taxi is a much more of a straight forward option. 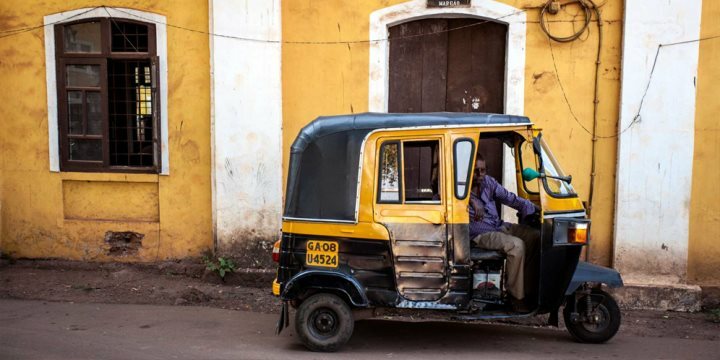 Find out more about getting around in Goa via our dedicated blog post. Need help with what to pack for a Goa holiday? Our top packing tips are sure to help.